Mondays. We can spend the weekend thinking Monday will be terrific, it's the beginning of the week, we'll start off at an awesome pace. 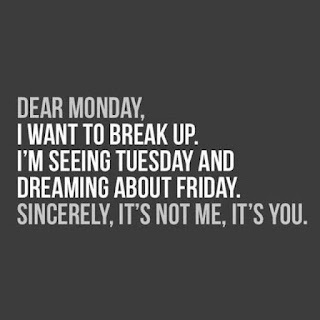 Or we know that it will be a MONDAY and be so jam packed with to-dos (because the weekend was inevitably spent catching up with family and other things) that it starts off with us turning off the alarm, staring out the window at the brightening light, and feeling like someone hit us over the head. And we haven't even gotten out of bed yet. 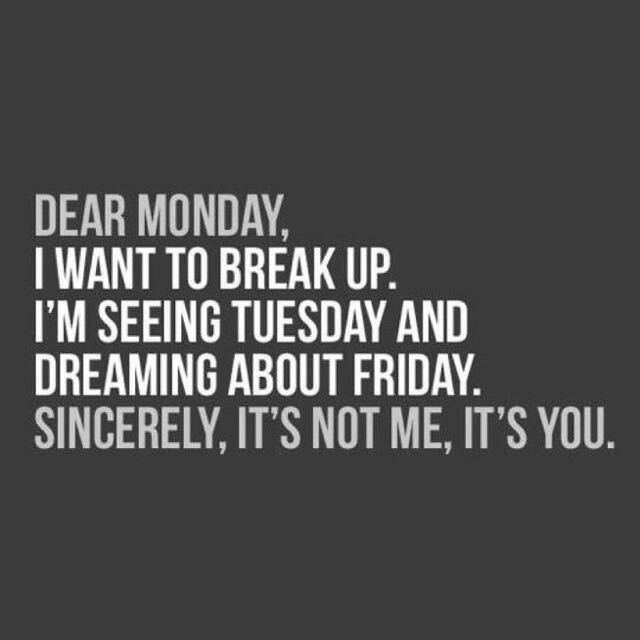 Yep, Mondays...gotta love them, right? I had a hectic weekend, but I am hopeful for this week--yet I was also stressed about it. Because I got my first commission for my garden care business (Nikki's Garden, more on that later), and I was so excited to start Monday--then I remembered later that I had JURY DUTY first thing in the morning! Good grief! And I couldn't get ahold of my client, because we didn't have time for her to give me her number. Ants were crawling all over our feet. (No joke). But she had all my info from the flyer, so I could hope for the best. Ends up that she won't answer the door so I left a note. Hopefully she'll give me a call. On a good note, all jurors were released today. Just had to give them an hour of my time and heck of a drive. At least I saw an area I'd never seen before. I'm convinced that I must have crossed into a neighboring town. It did not look like Amarillo. Going to have to investigate later because now I'm curious. Amarillo does always end up being bigger than I expect and I've lived here for over 20 years. Go figure. So this is how my morning went: got up at 7:20am, got ready with my boyfriend (me for jury duty him for work), and then discovered that his car still wasn't working so I hurried up and dropped him off at work, came back home and finished getting ready, and zoomed off to answer for jury duty in time. I was four minutes late. I hate being late. Turned out it was no problem. Sat there for an hour anyway, and got a text from my boyfriend asking if I could return his card. I'd forgotten I still had it from when I had to go get gas and jumper cables the day before. So thank the Lord all jurors were released. I hurried home, got together all the stuff I needed (packages to be sent out--selling videogames and movies on ebay for the fam right now) and got Lupitas burritos and JiggleBerry smoothies for lunch. My man was happy. Then I tried to talk to my client, but she still wouldn't answer the door, so I left a note and went and mailed all my packages. Ate lunch with lovely boyfriend, commented on how tired we were. Came back home and tried to get things done, before I have to go to work after all. What I wouldn't give for a guilt-free nap. I'm repeating certain things, so I'm obviously tired. I'm not used to going to bed "early" anymore. I gt off at midnight and usually fall asleep by 2. So yep. Heck of a morning. Perhaps tomorrow will be easier, and more things will be accomplished. For me, being the "accomplishment-junkie", I never truly seem to sleep. I happen to fall asleep thinking about what all needs to be done the next day. Especially Mondays.